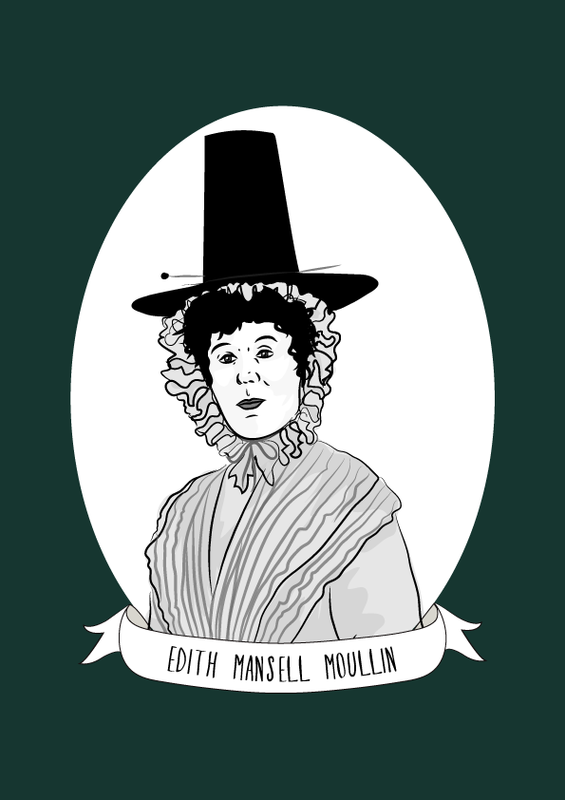 Edith Mansell Moullin was an English suffragist with Welsh heritage. She founded the Cymric Suffrage Union (CSU) to fight for women’s suffrage for Welsh women. Moullin was involved in activism for most of her life, after finishing her education, she worked in the slums of Bethnal Green to help improve the lives of those living in poverty by providing daycare, education, and healthcare. She witnessed the Match Girl’s Strike in 1888 and assisted during the London Dock strike of 1889. In 1906, Moullin joined the Women’s Industrial Council, the Women’s Social and Political Union (WSPU) and became the first treasurer of the Church League for Women’s Suffrage. In 1910, Moullin shared the stage with Emmeline Pankhurst at a demonstration held in Hyde Park. A year later, she organised the Welsh section of the “Great Demonstration” for suffrage as part of the coronation procession for George V. Moullin encouraged participants to wear traditional Welsh national dress and after the procession, founded the Cymric Suffrage Union (CSU). Moullin went on speaking tours of Wales and organised for information about suffrage to be translated into the Welsh language to be distributed to in Wales. Following Moullin’s imprisonment after being arrested in a demonstration in front of Parliament in November 1911, the CSU was disbanded and replaced by the militant Forward Cymric Suffrage Union (FCSU). Moullin focused her attention on speaking out against the force-feeding of suffrage prisoners and was named the honorary secretary of a group formed by Sylvia Pankhurst to repeal the Cat and Mouse Act. Moullin resigned from the WSPU when they took the decision to suspend activity to support the war effort as she was a pacifist. She collected funds to support the Welsh miners who were losing their jobs due to German prisoners being sent to work in the mines. Moullin also protested for equal pay for women workers doing relief work. She resigned from the FCSU in 1916 due to her health, but continued her commitment to social change until her death in 1941.